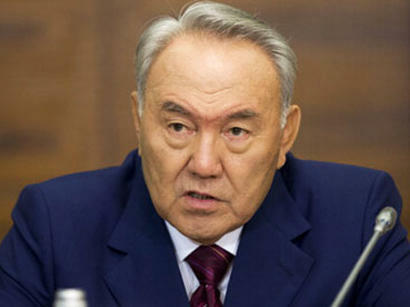 Kazakh President Nursultan Nazarbayev has expressed his condolences to Azerbaijani counterpart Ilham Aliyev in connection with fire in the Republican Drug Rehabilitation Center, which led to casualties, said a message posted on the website of the president of Kazakhstan March 2. Nazarbayev in his letter of condolence voiced deep sorrow at the news of numerous casualties. "Sharing the pain of the brotherly people of Azerbaijan, on my own behalf and on behalf of the people of Kazakhstan, I express condolences to the families and friends of the killed. I wish a speedy recovery to the injured," the letter reads. A strong fire broke out at 06:10 (UTC +4) on March 2 in a one-story building of Azerbaijan’s Republican Drug Rehabilitation Center. Twenty-five people died as a result of fire, says a joint statement of the Ministry of Internal Affairs, the Prosecutor General’s Office, the Ministry of Emergency Situations and Health Ministry of Azerbaijan. The State Commission was created in order to investigate the causes of the tragedy and to eliminate the consequences.